Driving with worn tires is dangerous. Reduced braking, steering, and traction could result in an accident. Replacing just one tire is dangerous. It could cause poor handling and poor braking resulting in loss of vehicle control. Mazda strongly recommends that you replace all four tires at the same time. 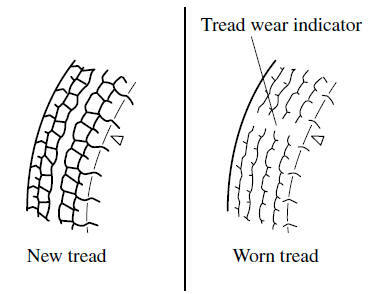 If a tire wears evenly, a wear indicator will appear as a solid band across the tread. Replace the tire when this happens. Tires degrade over time, even when they are not being used on the road. It is recommended that tires generally be replaced when they are 6 years or older.